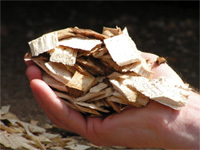 Biomass is living and recently dead biological material that can be used as fuel or for industrial production. DNR Forestry's Biomass Program deals specifically with woody biomass. 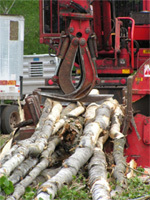 Woody biomass includes logging residue (nonmerchantable tops and limbs left over from a commercial timber harvest, nonmerchantable small-diameter trees and stems, dead standing trees, and down logs), primary and secondary mill residue, dedicated energy crops, urban forest–clearing material, land-clearing material, and brushland material. Biomass Crop Assistance Program (BCAP) is back and will open for business. On March 3rd 2015, USDA published the proposed final rule on BCAP in the Federal Register. BCAP provides up to $25 million each year in financial assistance to owners and operators of agricultural and non-industrial private forest land who wish to establish, produce, and deliver biomass feedstocks to a qualifying energy facility. The rule includes modifications to cost sharing, eligible types of biomass and other definitions. Stakeholders are encouraged to visit www.regulations.gov to review program details and provide comments during a 60-day public comment period. Comments are due by April 28, 2015. The full program will resume in 90 days on May 28, 2015. Additional information on application dates will be announced this spring. For more information on the program, visit the web at www.fsa.usda.gov/bcap and to learn more about the Farm Service Agency, visit www.fsa.usda.gov. MN to host International Biomass Conference and Heating the Midwest this April. This April 20-22 in Minneapolis, MN, the International Biomass Conference and Expo will take place. Now in its 8th year, the International Biomass Conference & Expo is expected to bring together more than 1,500 attendees, 220 exhibitors and 120 speakers from more than 40 countries. It is the largest gathering of biomass professionals and academics in the world. This year, Heating the Midwest will be co-located with the International Biomass Conference & Expo at the Minneapolis Convention Center. Wood-to-Energy Roadmap contains recommendations on creating a sustainable national supply of woody biomass developed by a team of scientific, academic, conservation, and forestry experts. The MN Business First Stop . Created by the Minnesota State Legislature, MN Business First Stop brings together a team of professionals from several state agencies, including the departments of Commerce, Transportation, Agriculture, Natural Resources, Employment and Economic Development, Pollution Control Agency, and Iron Range Resource's to help renewable energy and clean tech companies large and small with all aspects of project development, including feedstock identification, financing, environmental permitting, and site selection. DNR's Utilization and Marketing Program prepares biomass supply analyses for individuals interested in developing a biomass facility. This program aims to help individuals make informed decisions regarding the most efficient and sustainable use of woody biomass resources. DNR's Forestry Resource Assessment Unit is available to help quantify, locate, describe, and value forest resources; provide inventory design, cruising, data management, and analysis; and develop short- and long-range management plans that include financial, logistical, social, spatial, and temporal constraints. The unit tailors analyses to clients' management objectives, stakeholder comments, and land base characteristics.